LAST CHANCE for November 2v2!! Last chance to register for our 2v2 league!! Registration closes tonight at midnight!! See you soon on the squash court! 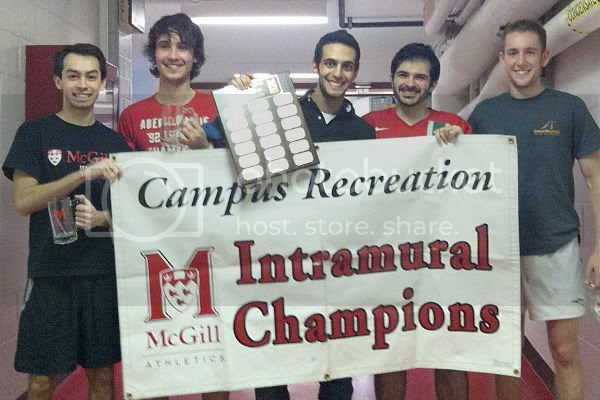 McGill 2v2 Soccer's 6th season is now concluded! 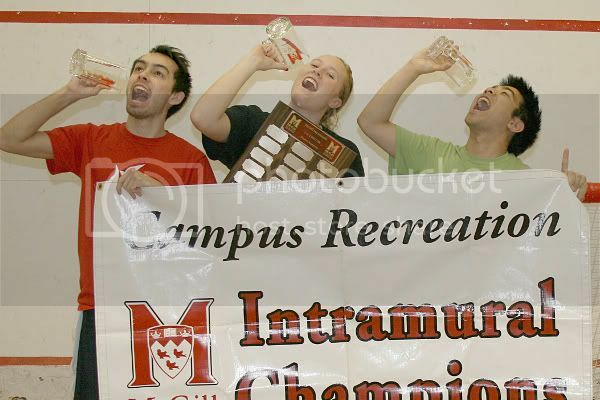 New team champions & intramural topscorers were crowned last week, and once again triple goalscoring-digits achieved in the rankings of the Men's division! We keep racking 'em up, and every year you keep bringing 'em down (and into the net)! I would like to thank all the participants and officials for their contribution at making this another successful season. Please make sure to SPREAD THE WORD to your friends about 2v2 soccer, as we continue to work hard in making every season even more successful and 2v2 soccer more popular among the McGill community! In Men's B, Pawelites battled hard throughout the season but ultimately was eliminated in the semi-finals round. They finish 3rd on the podium though, and also have the honor of placing BOTH their squad members atop the scorer rankings! Put your hands together for PAWEL MANKOWSKI, this year's topscorer with 103 and his teammate Calin Giosan (89 ). Down in the ladies' category, Two-Hit Wonders took the division by storm this year! 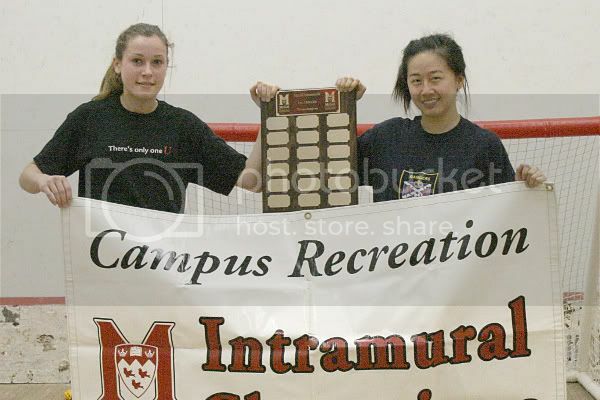 Not only do they claim the title of Women's B champions, but captain STEPHANIE RODRIGUE also finishes season topscorer!! She totals 68 high above everyone else, including 2nd-ranked Meghan Reid (Occupy This, 59 ) and teammate Che-Yun Kuo (57 ). Lastly in Co-Rec B though the season ended at the semi-final stage for HUGH PODMORE, the Pod Squad captain places himself on the highest step of the topscorer ranking thanks to a whopping 85 (being the only male member of his team, and thus able to play every set, surely helped)! Season champions Hungry Hippos also place a player on the podium, with JENNIFER NEWTON ranking highest among the ladies (58 ). Once again, congratulations to all the winners and be sure to come back again in May for more intramural action!! The SPRING LEAGUE is just around the corner! SCORER RANKINGS have been updated for all REGULAR SEASON games. TEAM RANKINGS are now finalized.